When I received Toshiba’s Camileo P100, it was “serious like” at first sight. This sporty pocket camcorder has plenty going for it. But it also turned out to be a little unreliable and hard to use. Out of the box, things got off to a promising start. This sleek model's pistol-grip case fits snugly and securely in my right hand, unlike some candy-bar camcorders which can be easy to drop. I flipped open the LCD panel to reveal a spacious three-inch touch screen. I was pleasantly surprised to learn this model had a 5x optical zoom. Not long ago, most pocket camcorders were limited to 3x digital zoom. On the back panel, I found the Record Pause button, which lets you pause and restart your video recording without generating a slew of video clips. We’re seeing this useful feature show up in more camcorders, but it’s still rare in pocket models. The Camileo P100 is slightly wider and thicker than most shoot-and-share models, but still measures a very pocket-able 4.4-by-2.4-by-2-inches, and weighs under 6 ounces complete with battery and SD memory card. It’s the same height and width of your iPhone, and almost as light. If you’re going to settle in with your new camcorder, the basics matter, such as reliability, clear communication, and simply feeling like it’s the right fit. In these key areas, the Camileo P100 disappointed. Let’s start with reliability. During the three weeks I used the original review model, it froze up eight times, several times in the middle of shooting. I had to pop out the battery pack, wait a minute, and pop it back in before the camcorder would restart. 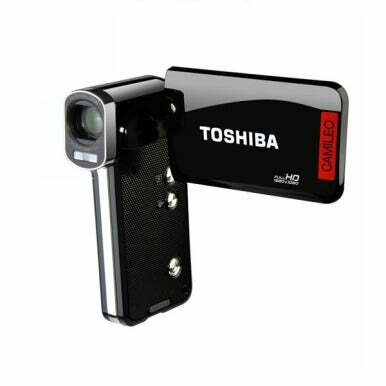 For many users, that problem would be a deal-breaker, so we asked Toshiba to send us a replacement camcorder to evaluate. That one worked much better. During the two weeks I used the replacement model, it didn’t freeze up at all. However, it suffered from the other drawbacks. Neither camcorder could retain the correct date and time stamp. Each time I programmed it, it soon fell back to the factory default (01/01/2010, 00:00am). Many users don’t pay much attention to the date/time stamp until it’s too late. A year or two down the line, when they’re revisiting old pictures and video clips, they’ll wish they had the correct date and time to help them figure out where they shot their images. Regarding communication, the Camileo P100 is the silent type. The camera screen sometimes offered too little feedback. For example, when I switched video resolution from 1080 to 720 or vice-versa, I had to trust the camcorder actually made the change I wanted. It gave no message indicating that a change had taken effect, nor does it show the current setting on the panel. I hoped to see more status icons, especially on this large screen, which can easily accommodate more of them. In fact, when I recorded video, the only icons I saw were for remaining battery life and a time counter showing how long I’ve been recording the current video. The battery icon randomly disappeared and reappeared. I got almost no warning before the battery died. Finally, the feel-good factor. Beyond the comfy pistol-grip, the Camileo P100 can be fussy to work with, especially for people with big fingers. I first ran into this problem with the back panel’s tightly clustered set of four buttons for zoom, wide angle, photo shutter, and video record. I kept accidentally pressing the zoom or wide angle key when trying to take a photo or start a video. The zoom’s touchiness compounds this problem. I spent extra time fiddling with it to restore previous settings after accidentally knocking them off. Finally, when you need to swap batteries, you may struggle to pop off the battery compartment cover, depending on your hand strength. To slide off that cover, I have to press down firmly with both thumbs in just the right place (near the case bottom) to dislodge it. Looking at other features, the Camileo P100 offers a mixed bag. For video and still shooting, this model comes with exceptional optics, including auto-focus along with the optical zoom. Other standout features include 8MP JPEG still photos (16MP interpolated), and strong video light for low-light shooting. Indeed, the Camileo P100 turned in some of the best test results of any pocket camcorder we’ve tested, scoring Very Good in all video and still image categories and Good for the audio test. These results rival some of the larger, more expensive models we’ve tested. When I filmed outside of my home, I was struck by how crisp the video looked from such a small camcorder, at least when I filmed in bright mid-afternoon light. The autumn reds and greens on the nearby maple trees appeared quite vivid—almost too rich. However, the video quality degraded rapidly when the light faded even just a little. Just after sunset, even with plenty of remaining light, trees, houses and other objects that looked very bright an hour before became mere silhouettes, and the auto-focus started adjusting constantly, vainly trying to find the right focal length. Shooting in low light, the Camileo P100’s auto-focus became a drawback. I couldn’t turn it off, and so ended up shooting video that’s frequently moving a little in and out of focus. The P100 comes with a relatively bright front-mounted video light. But like most such lights on small camcorders, it illuminates only a few feet in front of the lens, making it useful only for close-up shots. The Camileo P100 is one of the first pocket camcorders to support SDXC memory cards. This means you can put up to 64GB in the camcorder, which lets you shoot a whopping 12 hours of full HD video. However, actual on-board memory is almost nil, giving you just a few moments of full HD video capture, and Toshiba does not bundle an SD card. Figure on spending $20 for a 4GB SD Card rated at Class 4, the minimum Class recommended for Full HD video. With the Camileo P100, Toshiba bucks the annoying trend among pocket camcorder makers to entomb the battery in the case. Instead of forcing you to return the unit to the company to replace worn-out batteries, you can swap in a new pack. But don’t plan on long shooting sessions, unless you’re plugged into a power source. The Camileo P100’s lithium-ion battery lasted only an hour in our run-down tests, and took 7.5 hours to recharge when connected to my computer with the USB cable. I cut the recharge time down to a little under 4 hours using the supplied USB wall power adapter. The camcorder’s built-in file transfer utility (Camileo Uploader) and the bundled ArcSoft MediaImpression multimedia file management software work only in Windows, but I had no problem importing videos into iMovie and pictures into iPhoto on a MacBook Pro. If you want some of the best full-light video quality available for under $200, along with an exceptional feature set, consider the Camileo P100—but only if you get a solid money-back guarantee so you have a chance to give this camcorder a thorough vetting. If you're looking for very good video quality in a pocket model, and are fine with the candy-bar form factor, consider Kodak’s PlaySport Zx3. It’s less expensive ($150), and ruggedized to boot.